Numerous satellite TV and radio stations serving viewers in the UK and Republic of Ireland have been moved to temporary frequencies/transponders as a result of an ongoing legal battle between the two operators responsible for the satellites serving the British Isles. Satellite TV operators are working hard to ensure services remain available on Sky and Freesat through the transitional period. The changes affect services that have previously broadcast via the Eutelsat 28A satellite using a frequency band that rival SES (Astra) now claims as its own to use from the 4th October 2013. The matter continues to be fought in the courts, but a recent ruling in Germany resulted in Eutelsat being told to stop broadcasting services in the contested frequency band by 4th October. Consequently, services are now being transferred from Eutelsat to SES Astra's fleet of satellites. Affected channels include BT Sport, Al Jazeera English, S4C and Planet Pop. Satellite uplink providers and platform operators have enacted plans to ensure viewers do not lose services during the transition, which mean that some frequency and parameter changes are taking place. Ahead of the 4th October 2013 deadline, affected services have begun to be broadcast on temporary frequencies away from the contested frequency band in the event of any last minute complications - legally or technically between SES and Eutelsat around the 4th October. From the 4th October, SES and its Astra 2F satellite are scheduled take over the Eutelsat 28A frequencies. SES will then begin commence broadcasting services on the frequency band, with the temporary services running as a simulcast until 10th October. 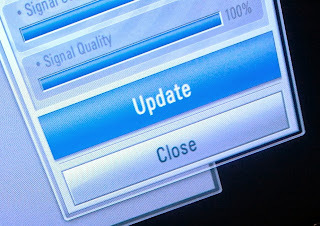 The changes will mean that viewers with generic free-to-air satellite receivers will need to retune twice in the coming fortnight to continue receiving all available services, and to regain access to any missing channels, but viewers with Sky and Freesat should see little disruption to their service, with both satellite TV operators working hard to ensure that their Electronic Programme Guides automatically redirect receivers to whichever frequencies are currently in use. Have you got Sky? Freesat? A generic free-to-air satellite receiver? Do you live in continental Europe? Read more about how the changes could affect you.